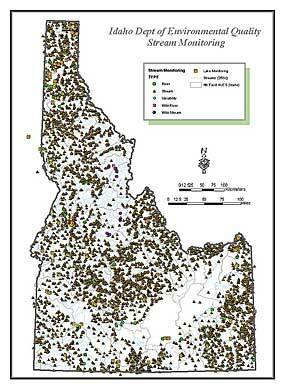 A statewide enterprise GIS was implemented to manage the massive amount of water quality data. 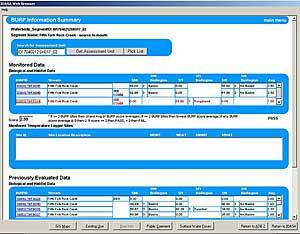 ArcSDE and ArcIMS provided indispensable functionality. In-house customizations were seamlessly integrated. IDEQ Interactive mapping (ArcIMS) and public comment web application displaying the results of Water Quality Assessments and locations of monitoring sites. 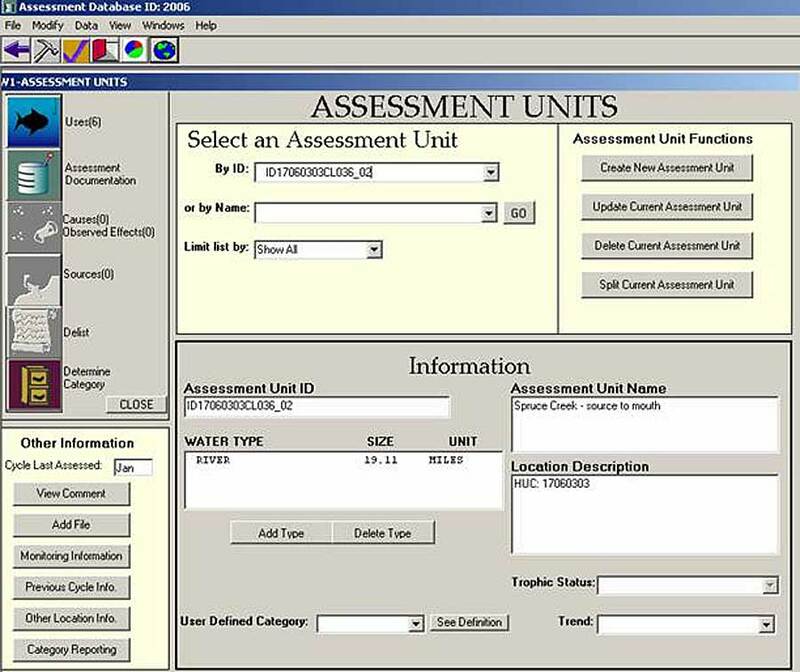 EPA's menu driven Assessment Database application (ADB) for storing and tracking water quality assessments. IDEQ's supplementary web application to ADB, (IDASA) that generates biological and habitat metrics used in assessments. ArcGIS toolbars and menus developed with ArcObjects (VB 6) that automate & display defintion queries, selection queries, hyperlinks, and automation accessing SDE & imagery datasets. With more than 92,000 miles of rivers and streams and more than 1,000 lakes and reservoirs, Idaho lists water as one of its most important resources. Idaho's rivers, lakes, streams, and wetlands not only provide great natural beauty, they also supply the water necessary for drinking, recreation, industry, agriculture, and aquatic life. The Federal Water Pollution Control Act Amendment of 1972 (Clean Water Act) requires states to provide, every two years, an assessment of the quality of all their waters and a list of those that are impaired or threatened. To efficiently meet this charge, the Environmental Protection Agency (EPA) recommends that states, tribes, and other water quality monitoring collaborators use a combination of monitoring and assessment techniques to reliably estimate the overall condition of all waters within a state, assess changes over time, and measure progress toward the "fishable-swimmable" goal of the Clean Water Act. The Idaho Department of Environmental Quality (DEQ) is responsible for assuring Idaho's streams, rivers, lakes, reservoirs, and wetlands meet their designated beneficial uses. DEQ must also prioritize site-specific assessments needed to confirm the location of both high-quality and impaired waters, as well as support control, restoration, and prevention actions under the Clean Water Act. Since 1993, DEQ has monitored and assessed nearly 63,000 miles of Idaho's waters, collecting biological, habitat, and chemical samples from more than 7,100 river, stream, and lake locations. 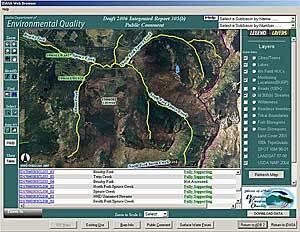 In order to manage and efficiently utilize the massive amount of water quality data being collected, DEQ implemented a statewide enterprise GIS in 2001, integrating its water quality monitoring databases with ArcSDE SQL Server and ArcIMS. 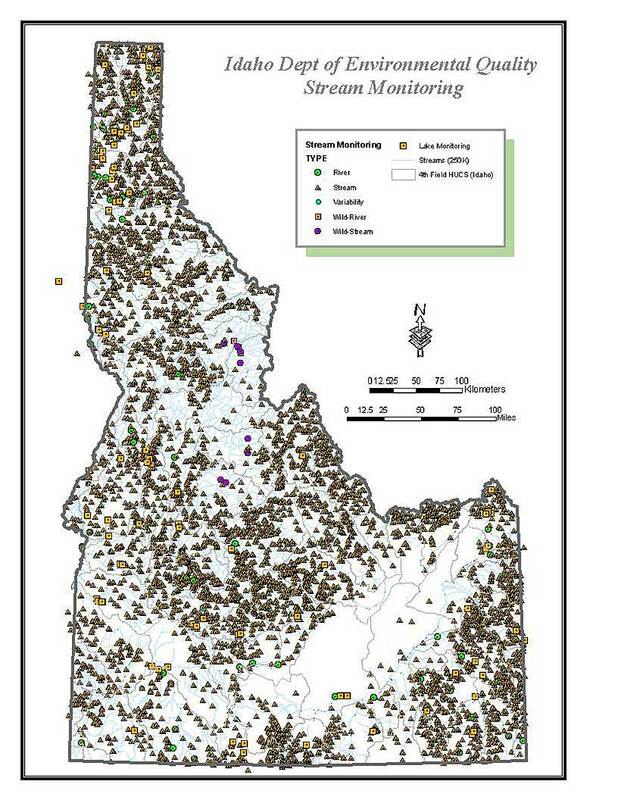 Idaho's water quality standards, or beneficial use identifiers, were linear referenced to the National Hydrography Dataset (NHD) and used as a primary base layer for analyzing, displaying, and reporting the results of stream water quality assessments. ArcSDE provided indispensable functionality, allowing DEQ to spatially join and relate monitoring and assessment data from multiple SQL server databases to NHD within ArcSDE. 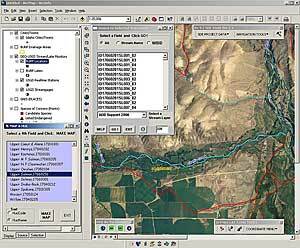 The integrated results are displayed through the Idaho state wide area network with customized ArcView, ArcGIS, and ArcIMS applications to DEQ's various field offices, as well as to the public through the Internet with ArcIMS. 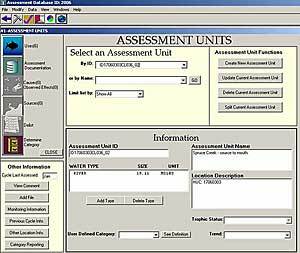 The Assessment Database (ADB), developed by Esri business partner Research Triangle Institute of North Carolina for EPA, is a relational database application for tracking water quality assessment data, including use attainment and causes and sources of impairment. 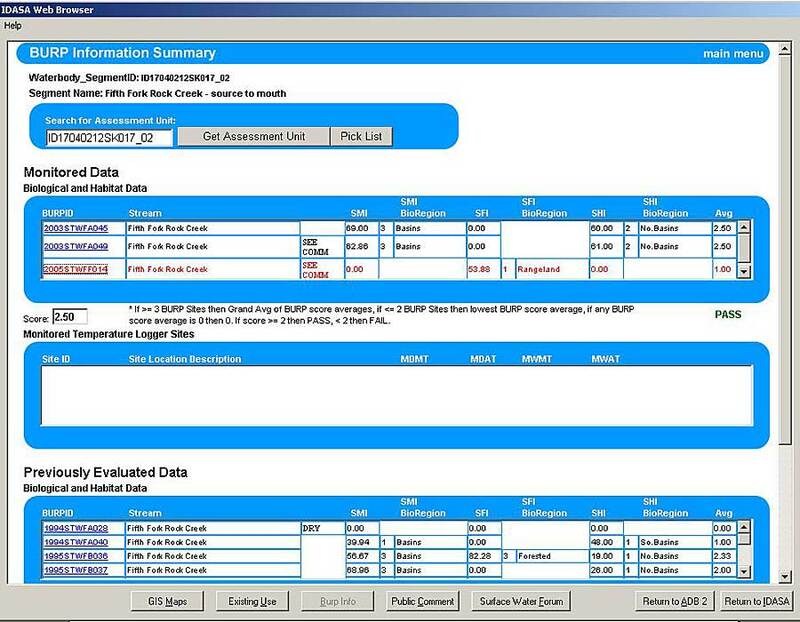 DEQ's customized deployment of ADB provides water quality analysts with a user-friendly, intuitive menu-driven process for analyzing monitoring data and reporting water quality status to EPA. 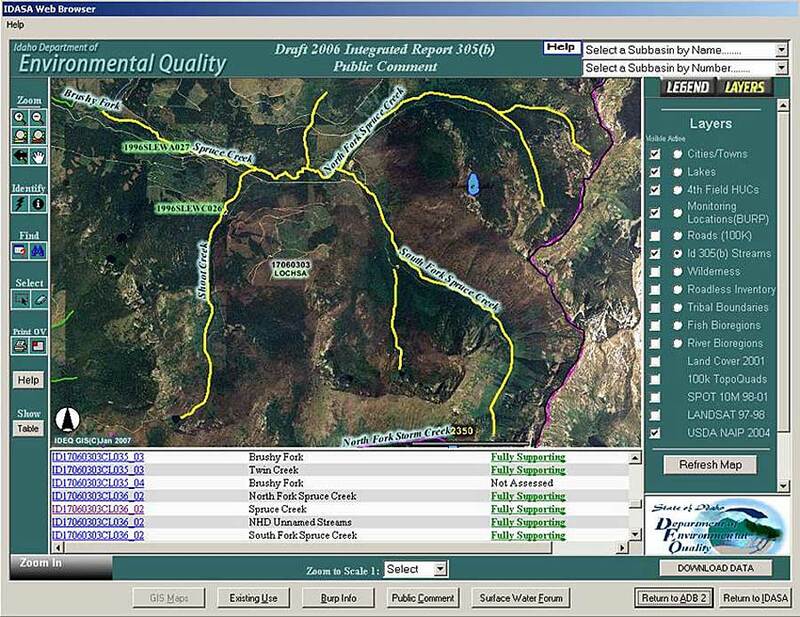 In-house customizations by DEQ have seamlessly integrated ADB with ArcGIS and ArcIMS, giving analysts the capability to additionally analyze stream drainage areas with current land-cover, land-use, and aerial photography geospatial data from DEQ's ArcSDE enterprise GIS. Custom ArcGIS toolbars developed by DEQ's GIS staff provide point-and-click data automation, enabling analysts and scientists to easily navigate through Idaho's hydrography layers and watersheds, while hyperlinked features provide real-time access to water quality reports and monitoring data. For more information, contact Jim Szpara, senior GIS analyst, Idaho Department of Environmental Quality (e-mail: jim.szpara@deq.idaho.gov, tel. : 208-373-0485, Web: www.deq.idaho.gov/water/prog_issues/surface_water/overview.cfm).